Just as his career was reaching its peak the Philippines found itself in the midst of the second World War. The artist and his family lived in the middle of the Japanese-occupied city of Manila and were not spared from the grim realities of war. Amorsolo rented another house near Raon Street where the women and children stayed while the men occupied the Azcarraga residence during the daytime which was near a Japanese garrison. Amorsolo did not let the war stop him from painting but his work took a dramatic turn. Difficult times during the war took its toll on the artist and his family. Amorsolo’s customer base dissipated in the face of the tough economic situation. Acquiring painting materials was a challenge. More importantly, Amorsolo was deprived of his frequent sojourns to the rural areas of Marikina, Antipolo, and other locales in the outskirts of Manila where he painted his popular landscapes. Not having access to his traditional settings, his paintings took on a darker tone. During the war, Amorsolo’s younger brother Pablo, an accomplished artist in his own right, was branded a Japanese sympathizer. He was captured and executed by Filipino guerillas in Antipolo. This personal tragedy, in addition to the devastation all around him, weighed heavily on the artist. Depictions of human suffering and tragedy dominated his canvases. The idyllic world within which the introverted artist chose to confine himself was torn asunder. It was during this time that Amorsolo’s work truly embodied the artist’s inner self. The paintings were not made in conjunction with a client’s preferences but were reflections of the conflicting emotions raging within. Amorsolo was deeply affected as he watched his surroundings ravaged by war. He painted burning edifices and mothers fleeing the scene with their children in tow. Women’s faces were filled with terror and despair as they were engulfed by death and destruction in their surroundings. Gone were the ebullient smiles, replaced by expressions of desolation. Rather than the noontime sun illuminating the main subjects, flames and embers from the burning ruins became the primary light source casting an eerie ominous glow. 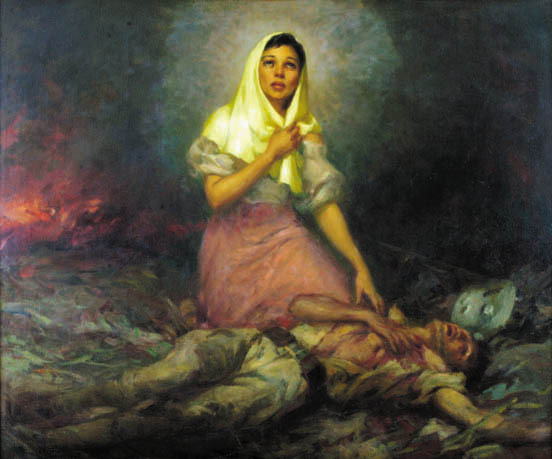 Even during this dark period, Amorsolo chose to portray despair not with an emotional outpouring of grief. It was very rare that a person in his paintings would be depicted screaming with rage or wailing in intense displays of emotion. Tragedy was portrayed through subtle means. In one of his more famous works, a woman is pictured clutching her veil while kneeling in front of her dead son --- apparently a guerilla soldier killed during a battle. The woman is looking up to the sky with a calm look of sorrow on her face. The subtle and restrained depiction proved to be a more powerful portrayal as the woman’s tearless eyes conveyed a more intense form of pain. It communicated to the viewer the deep sense of loss a mother feels when her child is taken away from her. On the flip side, men were represented not with expressions of rage but with looks of defiance. In his piece entitled Defensa de Honor, the man protecting the woman from being raped by a Japanese soldier had a determined but subdued expression. This was conveyed by the fiery expression in his eyes and the slight but firm downward turn of the corners of his mouth. Amidst the tragedy of the war, Amorsolo still inserted a hint of hope personified by the implied resistance of his characters to the occupying Japanese forces. His wartime paintings are considered among his finest work and were exhibited at Malacanang Palace in 1948.